Meet the man behind "Mr. Selfridge" and the woman who courted kings and brought Impressionism to America! "Love Under Fire: The Story of Bertha and Potter Palmer" tells the epic love story between young socialite Bertha Honoré and Potter Palmer, a self-made man 20 years her senior. Their passion for one another and the city they loved would inspire Chicago to rise like a phoenix from the ashes of The Great Chicago Fire. 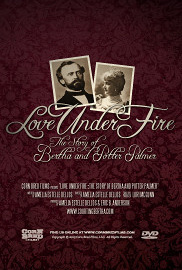 This documentary is the first phase in a three-part series of projects centered around Bertha and Potter Palmer, the Great Chicago Fire, and the pivotal role the couple played in both Chicago's and the nation's history. Phase Two is a theatrical production which began the development process in early 2013, and Phase Three is the feature motion picture "Courting Bertha," which is being developed simultaneously. The film originally premiered on WTTW Channel 11 in Chicago on March 24, 2013.